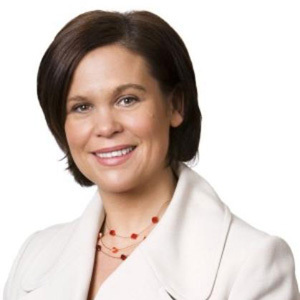 Deputy Leader of Sinn Féin and a Teachta Dála (TD) for Dublin Central, Mary Lou McDonald is also the all-Ireland Spokesperson on Mental Health and Suicide Prevention. She was first elected as the Teachta Dála for Dublin Central in 2011 and retained her seat in the 2016 election. McDonald served as Sinn Féin’s first MEP (for Dublin) between 2004 and 2009, during which time she sat on the Employment and Social Affairs and the Civil Liberties Committees, and was shortlisted for MEP of the year by the European Parliament magazine in 2007. She is also the Sinn Féin Spokesperson on Public Expenditure and Reform and is currently shadowing An Tánaiste.